By the fifteenth century northern European stained-glass designers as well as painters and sculptors demonstrated an increasing ability to represent the tangible nature of the real world. 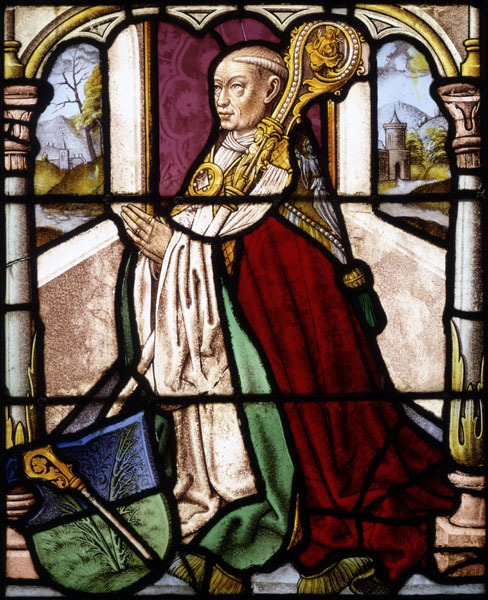 In this fragment of a window from the Monastery of Saint Barbara in Cologne, the figure, located in a believable three-dimensional setting, is depicted with the accuracy of a portrait likeness. The prior Peter Blommeveen, the donor of the window, is portrayed with a shield bearing a crosier and two "blossoming" branches that provide a visual pun on his name. The German Renaissance artist who made this panel retained earlier techniques of assembling colored glass set in a lead matrix, but his segments- larger than those of his predecessors- include more white glass. He also used the new method of silver-nitrate stain to achieve the various shades of yellow visible in the architecture. The full-bodied modeling of the figure and the richly worked crosier and damask robe (cope) recall images from the north nave windows of the Cathedral of Cologne, executed by the workshop of Hermann Pentelinck after designs of the contemporary panel painter known as the Master of Saint Severin.